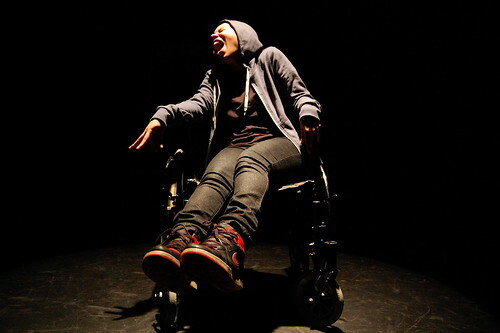 Safiya Martinez performs in the piece "So You Can Hear Me" at the dress rehearsal for SF State's Fringe Festival. Photo by Cindy Waters. Most playwriting students at SF State never get to see their creations come to life on stage with actors, design or sound. This is exactly why Roy Conboy, head of the playwriting program at SF State, created the One-Act Fringe Theatre festival 15 years ago. Last semester, Conboy and three students spent their Thanksgiving break reading and discussing more than 60 scripts submitted by students for this year’s annual fringe festival. This was the highest number of submissions since it began, and it included several exceptional plays. This led the selection committee to the decision of extending the festival of student written, directed and acted works to the longest it has ever been: three weeks. Ben Calabrese, a theater student, festival producer and member of the script selection committee, is happy that this year’s event has been able to accomplish what it set out to do: show off student-written work. “We had a lot of submissions and a lot of really good submissions. We felt that there were enough that we could base three different programs off of them and not water down the event at all,” Calabrese said. The festival offers open writing submissions to all SF State students on campus. Any student can submit a script to be reviewed and if it’s picked by the selection committee, they will work with the writer to choose students to direct and act in the play. Alandra Hileman, a 23-year-old senior, submitted her comedy “The Proper Rules of Urinal Etiquette,” inspired by her experience with the “bro code” she has learned over the years from her many guy friends. Her play was one of the 13 selected for the festival, and will be showing during the third week. Extending the festival an extra week gives more opportunities for students to see their writings come alive on stage, but it’s also much more work. Finding room for rehearsal space among the other upcoming main stage productions is just one of many problems the festival faces. With the number of plays showing in the short span of time, everyone is feeling the pressure, especially the stage managers in charge of getting all the technical aspects in line, including the lights, sound and props. Brandyna Bishop, a 22-year-old junior and stage manager of the One-Act Fringe Theatre, said the event is a good way for students to get involved in all aspects of theater production despite the challenge of putting on so many plays in so little time. Each of the three weeks consists of its own set of plays that will show each night, Tuesday through Friday at 7 p.m. in the Studio Theatre at SF State through April 20. 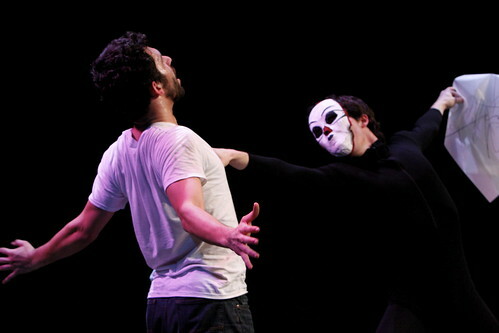 Stephen Patrick Frothingham (left) and Ben Calabrese (right) perform in the piece "Visitant" at the dress rehearsal for SF State's Fringe Festival. Photo by Cindy Waters.